Today's ill advised Big Food partnership comes from McMaster University's Athletics Department where they've sold out their various Marauders, to McDonald's. Though it's not clear from the press release how much McDonald's ponied up, their contribution's bought them, "presenter status" rights which means from now on the players of the games in multiple sports are going to be presented at the end of each game as the, "Big Macs of the Game". 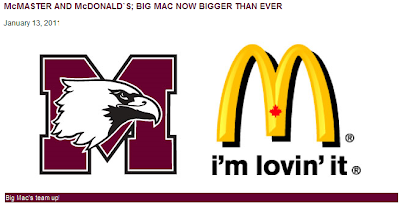 In what I'm sure has Hamilton's McDonald's owners salivating, their partnership with McMaster has also bought them the ability to influence youth in that McDonald's will now be running the Catholic Youth Organization "Small Fries Games", which will see community youth mingle with Marauder players during which time they will undoubtedly be bombarded with McDonald's advertising and coupons in events that by their nature will link McDonald's brand with fun, happiness and health. Great job McMaster. Way to be socially responsible.